Here’s How I Nearly Won over $100,000 This Last Weekend from Betting on Sports! 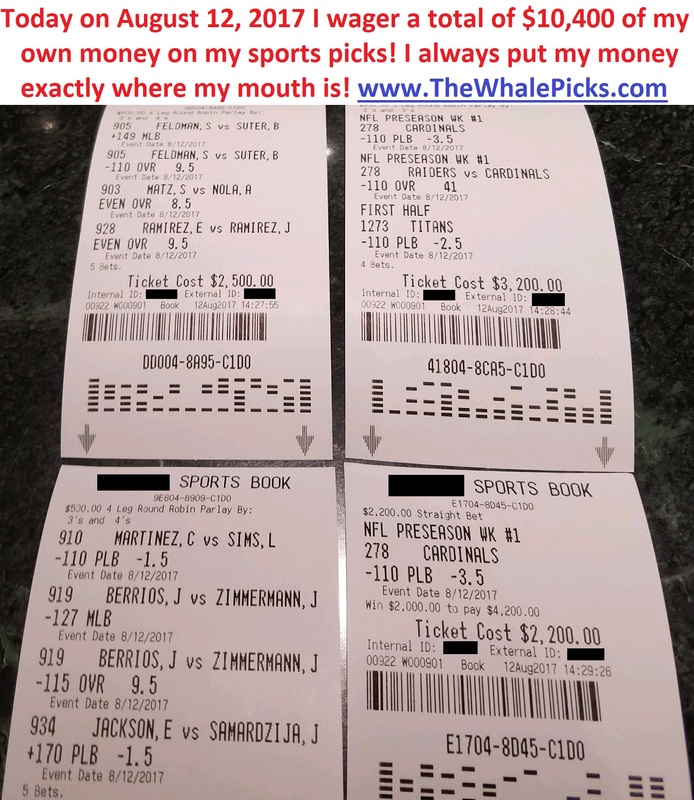 Below, you can see how I once again put my money exactly where my mouth is by betting nearly $30,000 on my picks over the weekend, and almost cashing out over $100,000! I know that it’s not enough for me to just tell you that I believe in my picks. I want to actually show you. There’s no better way for me to show you how much I truly believe in my own picks than to actually go out there and wager almost $30,000 on the same picks I shared with you. I want you to judge me based on my action and not just my words. I continue to bet hundreds of thousands of dollars every month on my picks because I know that it’s far more compelling for me to show you than for me to just tell you. 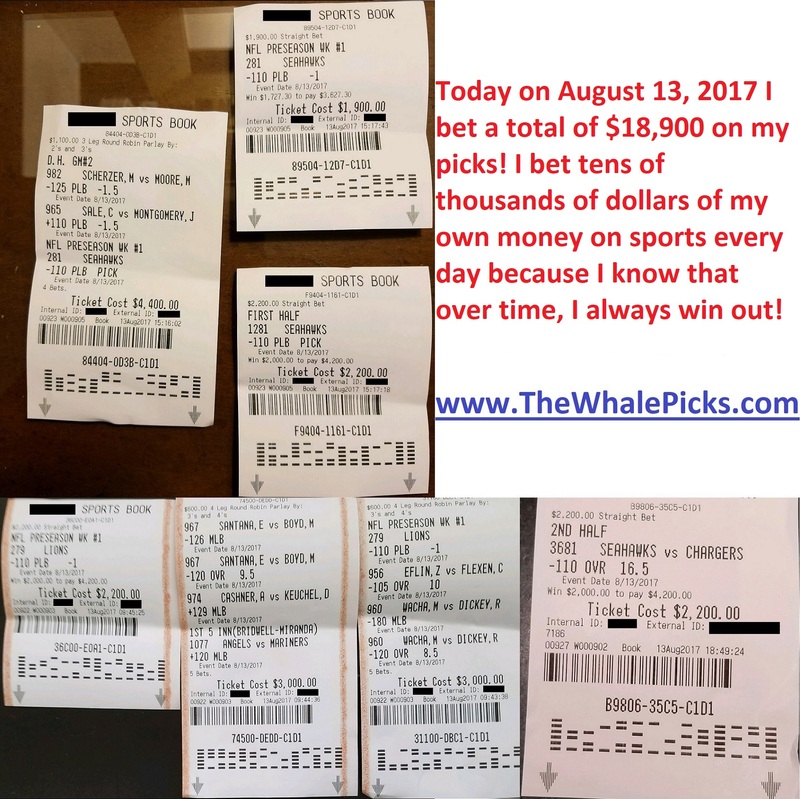 You can see proof of all of my millions of dollars worth in my betting tickets and results at http://TheWhaleTracker.com. You can be absolutely assured that I’ve got your back because I win and lose with you every single day. The only way that I can win is when I can help you win. Period! This last weekend is a preview of just how quickly you can bounce way up in profits once the patterns align. I was just inches away from making over $100 thousand dollars. As you can see, I never sweat the small losses from day to day because I know that once the streak comes, I’m going to be well on my way to winning hundreds of thousands to millions of dollars. I can tell you from the heart just how tough it can feel to experience through days and possibly weeks of losses. Losing is not fun, and no one knows that better than myself. But it’s important to consider the long-term outlook. Once you actually see it with your own eyes how quickly I can win and bounce up far ahead in profits, you’ll then understand why the losing days are almost irrelevant in the big picture. I don’t have to be betting tens of thousands of dollars a day. But the reason why I do it is because I know that over time, I always win out. Anyone who knows me personally knows that I am a man of exceptional intelligence and logic. I can assure of this: If I’m not 100% certain that I will win over time from betting on sports, there is not one single chance in hell that I would continue to throw down hundreds of thousands to millions of dollars every month betting on my picks. I literally have a million other better things to do with my time and my money than to be betting on sports if I’m not 100% convinced that I’m going to end up winning millions at the end of the ride.